Where would we be if Mother Teresa obsessed about her robes and her looks for hours each day? What if Madame Curie didn’t spend enough time in the lab and instead was in front of a mirror? Or if Sally Ride was worried about her weight and focused on her waistline instead of academics and pursuit/dream of being an astronaut? What if Nelson Mandela was concerned about his wardrobe and wealth instead of his soul and his country? What if Oprah had just sought fame and media attention by misbehaving and promoting materialism instead of making the choice to help people find solutions to their problems, inspire people to overcome obstacles and follow their hearts? Where would we be if Paris Hilton had a sense of true values and compassion for girls and young women? Or cared about and made an effort to help girls in third world countries? Was a volunteer for a community (not because of criminal punishment) or a Harvard grad student with honors in stem cell research? She could clone herself…..just kidding. What if…we were all less concerned, distracted and deluded by image? What would we accomplish? What kind of person would we be? According to the latest research – other nations are surpassing our academic achievements by leaps and bounds both at the high school and college/university levels. America is failing academically and in many other ways. The richness of a nation is measured by it’s shining contributors to society and the world. How can we inspire our girls to untangle from the media matrix’s web and be free of the distracting and misleading ‘values’ it peddles? thanks to Trisha Graves for sharing this video! I use this as my ANTHEM! How much do you spend a month on beauty products? The average woman spends approx $30-50 a month of beauty products (hair, skin, nails) Many of the products are full of toxic chemicals that are linked to cancer, reproductive issues, developmental problems in children etc. Why are we paying to pollute ourselves? Oh, right, for the chance to look younger and healthier. Well, I’m going to share with you the ONE beauty product that has worked for me and it’s 100% healthy, pure and will do more for you than $10,000 worth of skincare & haircare products. Do you want to know what the beauty industry doesn’t want you to know? Mother Nature makes it = WATER. Pure, clean water will purify, cleanse and purge toxins from your blood stream and body – helping you look younger longer and keep your healthy glow. People are amazed at how few wrinkles I have or they can’t believe my age — I attribute it to my water intake. I drink almond milk (due to being lactose intolerant) and organic fruit juice (diluted 4:1 water/juice). I sun tanned like most girls in high school and college and my skin has few wrinkles. Alcohol plays a part in dehydration so it’s important to limit this culprit. Genetics plays a part – yes. But drinking soda, coffee and high fructose corn syrup laden beverages will age you quickly over just pure clean water. Stress and alcohol are other big aging culprits. Stress is my only challenge since I have little alcohol and hate coffee (although I love the aroma). NO amount of cosmetic cream will make you healthier or younger. They will undoubtedly age your body with the chemical cocktail that seeps into your body through your skin. Your skin is a membrane and the beauty products go INTO you. Check out this AWESOME VIDEO about the toxic chemicals in beauty products and even childrens’ products. With the money you’ll save on beauty products you can donate to an environmental group, order a copy of my documentary, learn a new language, go on a vacation and so much more! And you will slow your aging process down! Also check out this article about children going to spas! Rush Limbaugh believes that any S.I. swimsuit model magically has a supernatural ability – to know what healthy eating and lifestyle is all about. As a former Elite International model I can tell you this is absolutely ABSURD. Rush may as well have said that he nominates the Sports illustrated swimsuit models for our Department of Health. Thinness and Health are NOT RELATED. This is a HUGE misconception in our culture. We’ve allowed fashion designers and editors to be our health experts when in fact they have NO MEDICAL TRAINING. They have pushed the body size standard for models from an 8 to a 6 to a 0 in less than 2 decades. When I modeled the runway models were Cindy Crawford, whom I’ve worked as a double for, and she’s larger than I am. According to today’s ‘fashion designer standards’ Cindy Crawford would be a PLUS SIZE MODEL. What would Rush say about that? Marylin Monroe – forget it – she’d be a ultra plus. Things have got out of hand and mouth. Rush needs to put one in the other and keep it there. Most media prey on your fear. The only way to outsmart them and drop off their radar is to overcome your fear. Media preys on people’s fear of not being loved. Period. Conquer your fear of not being loved and you’ve disarmed the media. How does one overcome their fear of not being loved? First you have to commit yourself to the idea that you are worthy of being loved, you are lovable and you can love yourself unconditionally. There are many tools available. None are for sale. But nothing free comes easy, right? It takes effort, patience and dedication. Some people require hard lessons to get them to take action and others realize they deserve to love and be loved. Those who have to reach a threshold in order to take action may finally realize one of the following: they are in enough pain, have gone through enough sadness or feel enough anger in order for them to find another way out than what they’ve been trying. Most girls know of a few ways to attain the fame they desire. Firstly, fame to a girl can mean being known by her peers, by her school, recognized by her community or the nation. Why do they desire this? It’s human nature. In Cover Girl Culture, Dr. Deb Burgard points out that in every culture the youth look to their society to see which qualities are upheld or recognized. What their society values in a person. Our culture has taught girls that being thin, pretty and the newest ‘value’ – being exy, will bring you recognition. Toss in some bad behavior and you could make national news. Oh fame. So what can we do in our Cover Girl Culture to encourage another way to attain ‘fame’ and recognition? Give them female role models who attain fame by noble methods. Women who earn praise from society for truly valuable deeds. Better still, entice them with people who are noble AND receive great financial boon for their deeds. Oh ho! This will make it easier for girls to follow their inner heart’s desire instead of the mindless road to fame that has been our country’s folly. This combination is ideal because girls discover they can earn a good living AND be the best they can be for their community and earn the fame they desire. Let’s present role models who are young, middle age and senior to our youth. Even showing conventionally pretty women who lead noble lives is powerful because it gives girls the message that being pretty isn’t enough for a fulfilling life. The secret is in your deeds, your choices and your heart. How do we get these women national press attention? A conference? A contest in which women are nominated? What do you think? Pepsi pushing new SKINNY can at Fashion Week! OMG. They claim it’s “taller, sassier new Skinny Can” in “celebration of beautiful, confident women.” WHAT??? Firstly, Pepsi is a junk food drink, secondly how does a beverage reflect confidence? or represent a woman? Unless it’s breast milk I can’t see how a drink represents women. N.E.D.A. posted this breaking news. check it out. If their campaign works I will be REALLY worried about our nation’s collective female populations’ ability to take back our power and keep something as absurd as this from hitting the market. Health care sponsored by Disney? This morning, while at the airport in Phoenix, I heard on the news that Disney announced their next big target is newborns in the hospital! Come on – is there no place we can be free of media? Is our health care system going to be sponsored by the Magic Kingdom? Embrace this as a mantra to help you love and accept the body you received at birth. Nelson Mandela said to inspire ourselves to be better it’s wise to borrow inspiration from others. 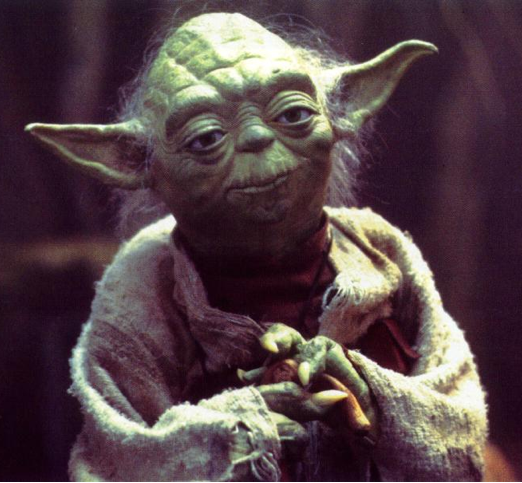 Today that inspiration is YODA.